Now you probably don’t believe me or take my word for it; I don’t expect you to, and you shouldn’t. I’m not here trying to sell you something that won’t benefit you. Heck, I’m not even trying to sell you anything at all. All I’m doing is starting the facts and features about this deep fryer in an organized and orderly fashion that will ultimately help you decide for yourself if this is a quality product. You may have heard of the T-Fal brand or you may have not, that’s not important. Most deep fryers have the same basic fundamental make-up so even if you’re not inclined toward the t-fal, you can still learn a thing or two. There, now you have no excuse not to read my T-Fal deep fryer review. It has large capacity and the triple baskets make multi-tasking easier. You can fry two different foods at the same time. This one is designed to use the most minimal amount of oil possible so you can enjoy the deliciousness of healthy frying. This compact deep fryer is perfect for individual use or a small family without plenty frying needs. This is one device that was designed with the family in mind. It can cook about 1kg of food in one batch. I knew I had to do this review when sometime last month I and a few friends went to hang out at a mutual friend’s place. Our host served burger and fries, spicy and crispy chicken wings with hot sauce, onion rings and frosty mixed drinks. Now I knew that this person was no chef, yet all the fried food came out amazing; crisp in all the right places and tender in all the right places. To top it all off, it didn’t even taste like the food was fried. I mean I knew it was fried, it was obviously fried, but there was practically no residual oil left on the food. Whatever excess oil there should have been had just – for lack of a better word – disappeared. I was really surprised and when I asked my friend how he managed, his reply was just as surprising. 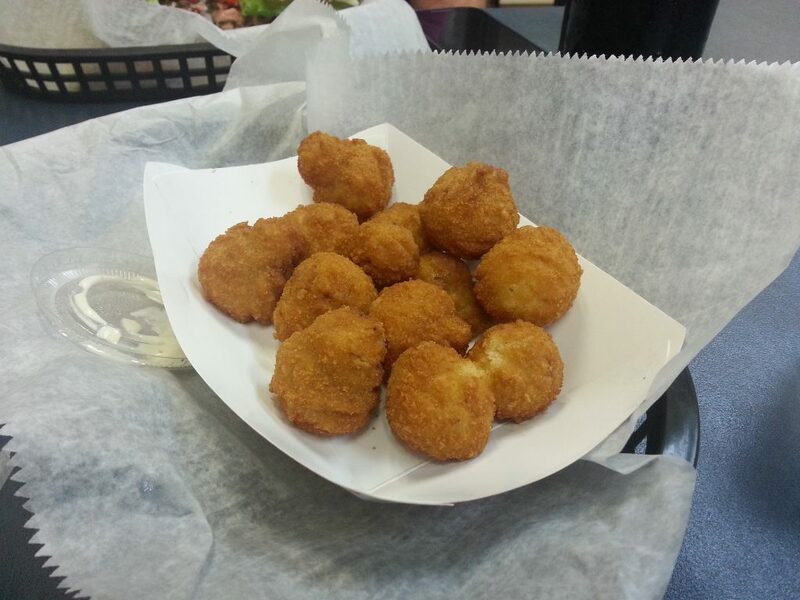 Deep fryers are all the magic you need to produce the best results. I decided then that when I got a chance, I would do a review on deep fryers. And that’s how we came to this passé. 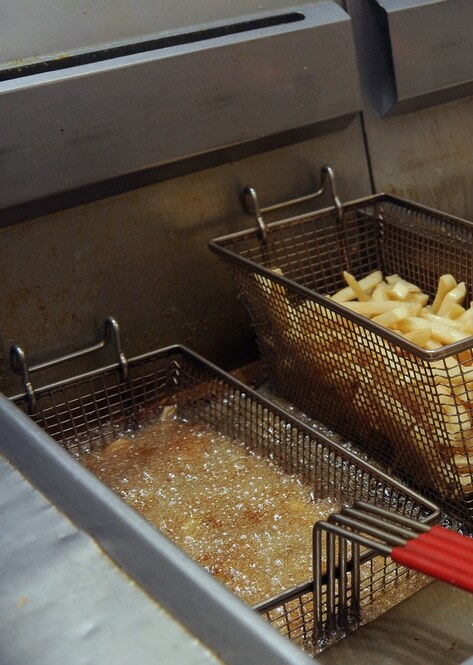 There are people who are so health conscious that the very notion of deep fryers would severely put them off. Frying and oil? No thanks, they can do without. I get that. Personally, I don’t indulge in frying often to keep my cholesterol levels in check. But one thing I’ve realized overtime is that apart from the method we use to cook, what we cook in can also affect the overall health of our meals (rusted metal, anybody?). And this is where the t-fal deep fryers come in. Made of stainless steel, they were designed to be food friendly. Let’s take a look at some of the most popular models. The t-fal family of deep fryers refers to a bunch of super amazing, ultra-high quality deep fryers from the electronics giant, T-fal. If you’re a regular fryer, you’ll need something that was built for regular frying and at the same time is easy to use and clean. T-fal has an assortment of deep fryers, and this is really good as it gives us a wide range of options to choose from. The T-Fal FR3900 electric deep fryer is stainless steel, has a 4 liter capacity, and triple basket. It has two small baskets and a larger basket so you can fry two different foods at the same time, with the same oil (that is if you don’t mind the oil mixing) or one large batch of food. The large capacity accommodates the whole family and even more, and it has adjustable temperature knobs (175⁰F – 375⁰F) so you can fry all your favorites at the temperature that best suits them and have them come out perfect. This unit also has a heating element that fully immerses in the oil and heats up quickly. All the parts of this unit fully dismantle and are dishwasher safe (with the exception of the heating element). 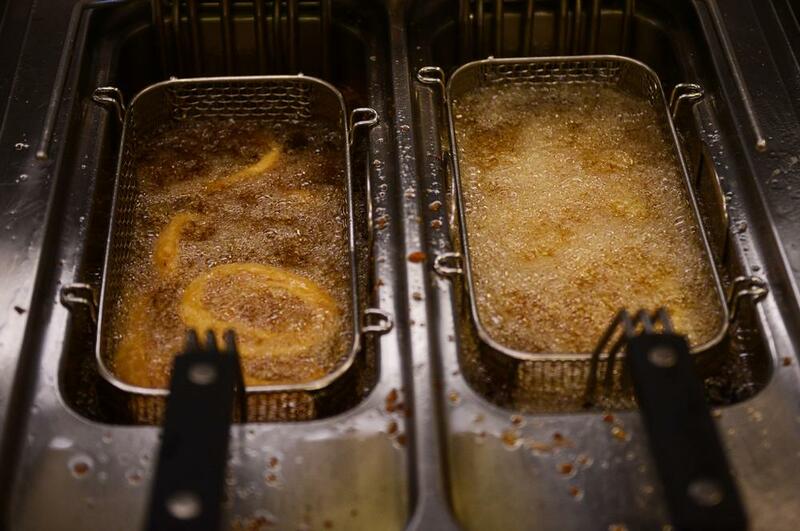 There is no dividing partition or compartment so that the oil won’t mix when frying two different foods at a time. The T-fal Ultimate EZ Clean FR8000 deep fryer is a complete, self-serving frying unit that lets you make restaurant quality dishes right in the comfort of your home without all the hassle and tussle that is often associated with restaurant kitchens. This deep fryer has a somewhat magical attribute. It’s a deep fryer with oil storage – I mean built-in oil storage! That’s as cool as cool gets. This magic begins with a stainless steel lid that has a viewing window, allowing you to monitor your food while it’s cooking. When you lift the lid, you come to face with the two-position basket nestled in the stainless steel oil container. This basket is set in two positions; one for cooking food in hot oil and the other for draining the food. The basket leans against the high power heating element. The heating element consists of the heating rings and a control panel that has adjustable temperature knobs that can get up to 375 degrees set to both Celsius and Fahrenheit. This is quite a relief for those of us who don’t like math and have issues with the conversion. Frying at an adjustable temperature lets this device minimize oil absorption into the food so the food is never soggy or creasy. A health bonus! As an added measure, a safety breakaway power cord is attached to the back of the heating element. It fits very tightly and only breaks away when enough force is applied. This way your device won’t trip off when it’s in use and you can yank on the cord to pull it out in case of a real emergency. It can generate up to 1700 watts of power and this makes your cooking very fast. The heating element rests on the oil container and the heating rings extend below to lie on the container. The oil container is made of stainless steel and can hold up to 3.5L of oil. This means that this unit can cook about 2.7 pounds of food at a go! The oil container is removable and contained within a stainless steel cool casing with hands that remain cool to the touch even when the device is in use. My favorite part of the FR8000, and the best part in my opinion, is the detachable oil drainage system. Yes, you heard me well. This is a deep fryer with an oil filter. The plastic oil drainage cartridge is under the oil container and hooked at one end to the stainless steel casing. A single dial knob on the casing activates the oil drainage system and whatever oil is in the oil container is filtered and drained into this compartment. This oil and plastic cartridge can be refrigerated, frozen or just simply left in the machine – and it will not turn rancid because the cartridge is sealed. The entire unit is of solid build and the stainless steel fits easily with any kitchen décor. 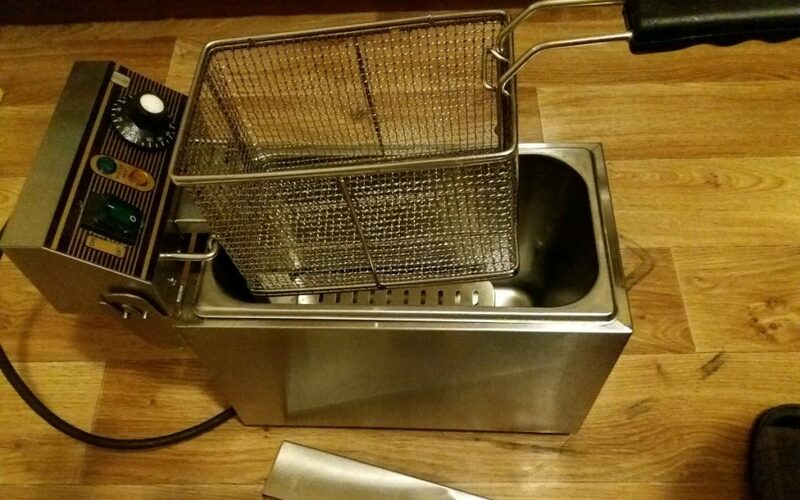 It’s an easy clean deep fryer and all the parts are dishwasher safe except the heating element but even that can be easily cleaned with a sponge. The unit comes apart easily and builds up just as well. This unit is a complete workhouse and it comes with a one-year warranty. This all sounds too good to be true, I know, but before you get in over your heads, let’s look at some pros and cons. 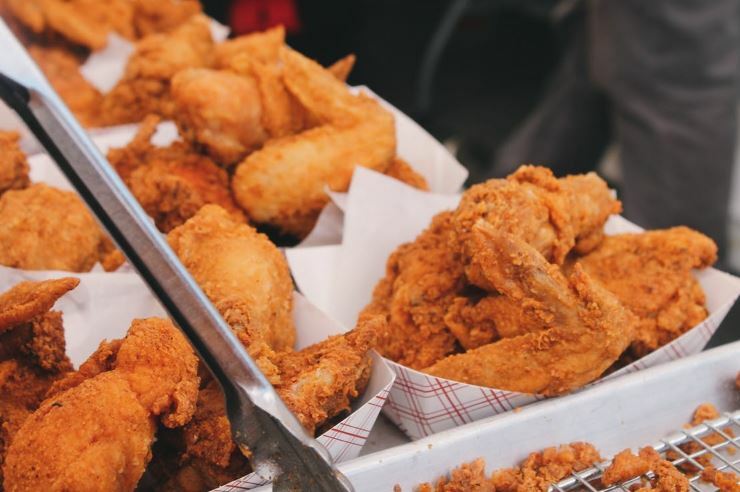 The system is designed to use the most minimal amount of oil possible, so you can enjoy the deliciousness of frying without having the associated health hazards. The 1700 watts power capacity allows food to cook really fast and really well, and this lets us save very vital time. The heating element is immersed in the oil, and this prevents the outside temperature from being too hot – a great safety measure. The best part of this unit is the drainage. No stress and no mess. 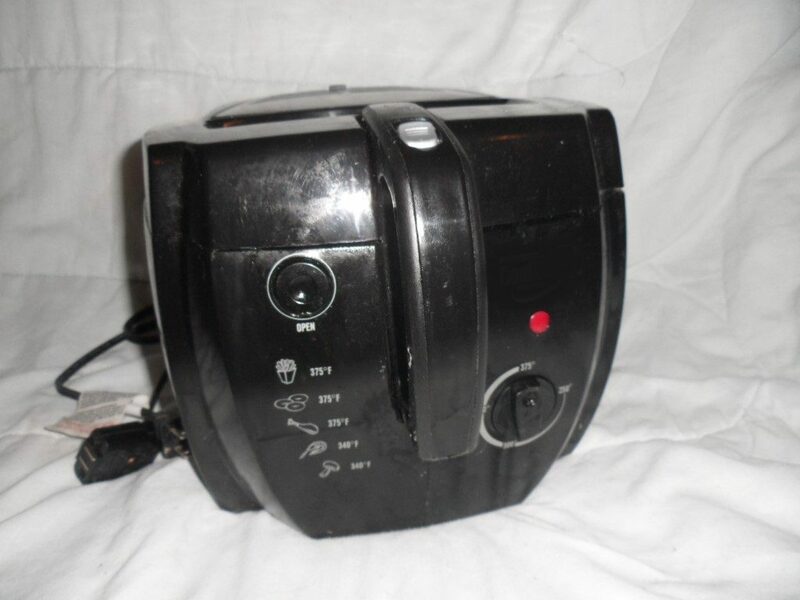 It’s a deep fryer that actually takes care of itself. Save dismantling the unit and putting it in the dishwasher, it is self cleaning. The filter in the oil container makes sure that debris gets into the sealed cartridge so the next time you want to use the oil; you always have clean, fresh oil to use. For a large size of deep fryer, 3.5L is not very big. It comes with only one basket, and this doesn’t give room for multiple batch frying. The T-fal FF1628 is a T-fal compact deep fryer but this in no way undermines its functions or capabilities. It has a food capacity of 2.65 pounds and can hold up to 2.1L of oil. The heating element has a power output of 1600-watts. It features an exclusive oil-filtration system that allows for easy clean up and multiple uses, just like the FR8000. As part of the filtration system, the deep fryer comes with a patented filtering mesh that is placed inside the bowl throughout the whole frying process. Once the frying is done and the oil has cooled, you can easily filter in one simple step. The Filtra One deep fryer offers maximum capacity with compact size. The body of the fryer has preset timing that gives you specific cooking times for different foods gradated in both Celsius and Fahrenheit. With the adjustable thermostat, you can set your temperature from 150⁰ to 190⁰ to always get the best results possible. It also has a cool touch exterior which is made of aluminum and is of the color black. The Filtra One deep fryer boasts of a dishwasher safe removable lid that is lockable with a large viewing window on the top and permanent grease filter. This is one device that was designed with the family in mind. With the T-fal FR4049 Family Pro deep fryer, your home cooking will be improved several notches and will taste better. You will also save a lot of money because instead of going to get French fries and chips for your family, you can make your own and store it for your home use. The Family Pro deep fryer has a 3L oil capacity and can cook about 1kg of food in one batch. Like the other T-fals, it has a lid with a viewing window, stainless steel mesh basket, removable tank or oil container, dishwasher safe parts and cool touch carrying handles. As an added bonus, it has a temperature-ready indicator light and a countdown timer which makes the cooking process easy. It is equipped with a 1600-watt power build coupled with the adjustable thermostat that allows you to set the perfect temperature for frying which in turn guarantees crisp results every time. It also has a magnetic safety plug and a general stainless steel casing. The product dimensions are 19.3 x 12 x 13.6 inches and it weighs 11.8 pounds. The ready indicator light lets you know what set temperature you’re working with and the timer lets you know when the food is done. There is no automatic oil drainage system – you have to turn the oil out manually. It is set to only one degree so you will have to perform the conversion calculations yourself. So… T-Fal deep fryers or nah? Familiarity can be calming, not to mention safe, but where’s the room for adventure? I dare you to come out of your comfort zone and explore the world of possibilities that deep fryers hint at. The T-fal family of deep fryers is a good place to begin. The units are easy to use and there are all the other benefits that I’ve listed above. When you go deep fryer shopping, it’s always a good idea to buy one that is suitable for your kitchen size and keep in mind the average number of people you’ll be cooking for. What are you doing with a compact fryer when you’ve got a big family? Also keep your budget in mind, but don’t be too rigid. Allow yourself to be a bit flexible but be careful not to go too overboard. The stainless steel of the T-fal is good for aesthetics and keeping the hotness of the fryer relatively contained. The removable oil container and baskets are good, but not uncommon. Many brands have them. The T-fal does have some extraordinary features like the oil drainage, so I suppose that is something. I hope you’ve learnt a thing or two from this t-fal deep fryer review that can help you make your decision. 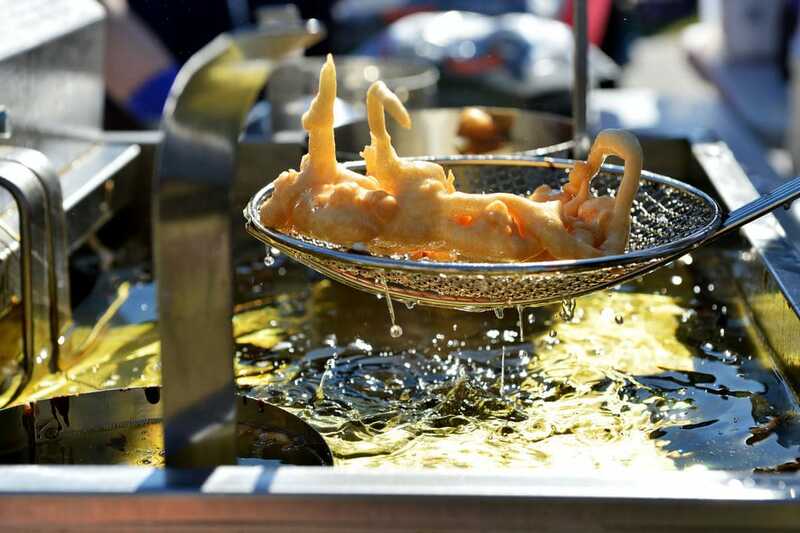 Whatever deep fryer you eventually go for, just have fun making all your favorite fried foods and share that special moment with friends and family. Enjoy!